Huagong Foam sealing machine ,the foam sealing equipment,is a facility designed by our company especially to two-component liquid resin. It achieves mechanical four-axis (X,Y,Z,W)linkage through the control of industrial computer. 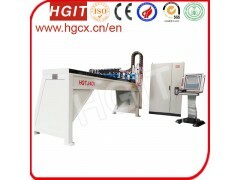 The two-component liquid resin of Foam sealing machine mix according to a certain proportion.Then the uniform mixture of Foam sealing machine is given out along a chosen track and foams in place operated by the Foam sealing machine.The processing speed can be up to 6 ~ 30 m / min depended on process requirements. Foam sealing machine machine is widely used in cabinets, lighting, automobile and other sealing areas.